﻿ France - Hiking Bordeaux High Class vineyards. Self-guided hiking tour across the most famous vineyards in the world. St Emilion, Sauternes, Entre-Deux-Mers are a mixture of beautiful landscapes, oenological pleasure and cultural discoveries. Many châteaux and wine cellars adorn the landscape with their sumptuous architecture. This varied walking tour, leads you on footpaths through vines and woods, edges of rivers and minor roads, and of course punctuated with wine producers! Each night will be spent in charming guesthouses, 3 and 4**** hotels, and sumptuous castles or wine châteaux in the heart of the vineyards. The guided visit of Unesco heritage in Saint Emilion and the wine tasting initiation are offered in this 8 day tour ! Arrive in Bordeaux by the TGV. Taxi transfer to your guesthouse in St Emilion. Dinner in a restaurant, in the medieval city. 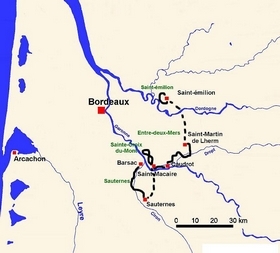 Saint Emilion vineyards – UNESCO world heritage site 2 options : 10 or 15 kms. 70 meters level variation Here and there Châteaux and wine properties, like Petrus or château La Clotte or Beau Séjour which stand proud with their history and the men who made them. Exceptional sites formed by a succession of valleys covered with vines. This "landscape" was the first “not architectural” site, classified by a UNESCO world heritage site. Back to you guesthouse or hotel and dinner in a restaurant located in the heart of the village. Saint Emilion : Exceptional ancient city. The city is an open air museum. Its troglodyte tradition is seizing, more than 70 hectares of underground galleries, remains of the great Roman time. The afternoon is dedicated to wine tasting. In the end of the afternoon, a taxi will take you to Camiran, in the “Entre-Deux-Mers” vineyard. Dinner and night in guesthouse. The Entre-deux-Mers area : from St Martin de Lerm to Caudrot - 15 Kms. 100 meters level variation The Entre-Deux-Mers area, between the Dordogne and the Garonne rivers, is a triangle of ground, water and stones which surprises by its cultural variety. You can stop at the Domaine de Bouillerot for a possible visit and tasting. Here since 1874 and 3 generations, the owner perpetuates the tradition. You will spend the night and the dinner in a restored old manor house, with a 3,000m² flowered park. From Caudrot to St Macaire. 10 Kms. 25 meters level variation You will walk in a landscape of greenery, along the vines and estuary of the Gironde River. Castles & fishermen huts offer astonishing sights. Discover the start of the famous “Canal du Midi”, linking the Atlantic Ocean to the Mediterranean Sea. The footpath leads to one of the doors of the medieval city of St Macaire where you will spend the evening and night in a hotel *** in the heart of the city. Loop from St Macaire to Sainte Croix du Mont 8 or 16 km according to option. 100 meters level variation Above Saint-Macaire, the hills open to splendid scenic views. Tobacco drying sheds, hills and small valleys with vineyards changing over to meadows and woods of leafy trees. The scenery is dotted with mills and castles with vast panoramas. The writer François Mauriac and the famous painter Toulouse Lautrec used to live in the area. Visit the Château Laurette, or the Château Loubens before reaching the perched village of Sainte Croix du Mont, offering a dramatic view on the Garonne Valley and remarkable wines. Transfer to Sauternes. Accommodation in the 17th century Château d’Arche ****, a Great Classified Vintage of Sauternes. Dinner in a local restaurant. The Famous Sauternes vineyards area. From Sauternes to Barsac. 15 Kms. 60 meters level variation. 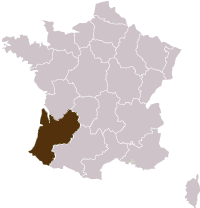 Follow the left bank of the Garonne, where are concentrated the high-class wines of Sauternes. Château La Tour Blanche and château Rayne Vigneau, appreciate the local heritage (churches, mills, laundrettes...) as well as landscapes of vine, forest and a wild small river formerly used for the transport of wood. The vineyard is prestigious and results from two centuries of know-how. Once accommodated, enjoy the “aperitif tasting” in the Château Gravas that Richard Coeur de Lion (12th century) already knew. Lodging and dinner in the 18th century castle of Camperos where you can to relax in the Jacuzzi. The price is valid for a minimum of 2 persons. The Taxi transfers from Bordeaux and 2 transfers during the stay. Ends in : Barsac (with possible transfer to Bordeaux). Access : Bordeaux Station. Trip from Paris by TGV (only 3 hours).